T-shirts are made from 6.1 oz. 100% cotton Hanes Tagless Tee. Half of the purchase price of these shirts will go to support our 12 Spanish translators & Rev.Enrique Mejia, Church Planter in the Dominican Republic, our Portuguese translator in Brazil and Rev.Glen Namoc, head of the N.Mindanao Bible Institute in the Philippines. With our continued support to these fine individuals Cutting Edge is helping to plant churches and spread the Gospel of Jesus Christ. A total of 24 records matched your search. Scripture at the bottom of the design is Romans 5:8 . Available on white,ash, natural or black, T-shirts are made Hanes 100% cotton Tagles Comfort Tees. Half of the purchase price of these shirts will go to support our 12 Spanish translators & Rev.Enrique Mejia, Church Planter in the Dominican Republic, our Portuguese translator in Brazil and Rev.Glen Namoc, head of the N.Mindanao Evangelistic Institute in the Philippines. With our continued support to these fine individuals,Cutting Edge & you are helping to plant churches and spread the Gospel of Jesus Christ. Stressed Out - But I can do all things through Christ who strengthens me. Available on white,ash, natural or black, T-shirts are made Hanes 100% cotton Tagles Comfort Tees. Half of the purchase price of these shirts will go to support our 12 Spanish translators & Rev.Enrique Mejia, Church Planter in the Dominican Republic, our Portuguese translator in Brazil and Rev.Glen Namoc, head of the N.Mindanao Evangelistic Institute in the Philippines. With our continued support to these fine individuals,Cutting Edge & you are helping to plant churches and spread the Gospel of Jesus Christ. Beautiful picture of a cowboy with a lariat standing in the door of the barn. Beloved verse Matthew 11:28. Available on white or black T-shirts that are made from 6.1 oz. 100% pre-shrunk cotton Hanes Tagless Tee. Half of the purchase price of these shirts will go to support our 12 Spanish translators & Rev.Enrique Mejia, Church Planter in the Dominican Republic, our Portuguese translator in Brazil and Rev.Glen Namoc, head of the N.Mindanao Evangelistic Institute in the Philippines. With our continued support to these fine individuals,Cutting Edge & you are helping to plant churches and spread the Gospel of Jesus Christ. For the golfer in your life, this shirt blends tranquil vistas on a golf course with Psalms 23:2. Available in white or black tee. T-shirts are made from 6.1 oz. 100% pre-shrunk cotton Hanes Tagless Tee. Half of the purchase price of these shirts will go to support our 12 Spanish translators & Rev.Enrique Mejia, Church Planter in the Dominican Republic, our Portuguese translator in Brazil and Rev.Glen Namoc, head of the N.Mindanao Evangelistic Institute in the Philippines. With our continued support to these fine individuals,Cutting Edge & you are helping to plant churches and spread the Gospel of Jesus Christ. Praying hands, American flag and an eagle. These pictures reminds us to pray for everyone in our armed services. Available in white or ash (light gray). T-shirts are made from 6.1 oz. 100% pre-shrunk cotton Hanes Tagless Tee. Half of the purchase price of these shirts will go to support our 12 Spanish translators & Rev.Enrique Mejia, Church Planter in the Dominican Republic, our Portuguese translator in Brazil and Rev.Glen Namoc, head of the N.Mindanao Evangelistic Institute in the Philippines. With our continued support to these fine individuals,Cutting Edge & you are helping to plant churches and spread the Gospel of Jesus Christ. 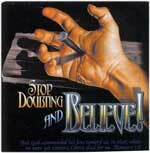 WS-9990-T-Shirt - ISA 26:4 Trust in the Lord Forever; For in the Lord Jehovah is Everlasting Strength. Everlast boxing gloves in red on a white or black tee symbolize Isaiah 26:4. T-shirts are made from 6.1 oz. 100% pre-shrunk cotton Hanes Tagless Tee. Half of the purchase price of these shirts will go to support our 12 Spanish translators & Rev.Enrique Mejia, Church Planter in the Dominican Republic, our Portuguese translator in Brazil and Rev.Glen Namoc, head of the N.Mindanao Evangelistic Institute in the Philippines. With our continued support to these fine individuals,Cutting Edge & you are helping to plant churches and spread the Gospel of Jesus Christ. Beautiful lighthouse scene on either white,ash (light gray) or natural Tee with this favorite verse found in Psalm 31:3.T-shirts are made from 6.1 oz. 100% pre-shrunk cotton Hanes Tagless Tee. Half of the purchase price of these shirts will go to support our 12 Spanish translators & Rev.Enrique Mejia, Church Planter in the Dominican Republic, our Portuguese translator in Brazil and Rev.Glen Namoc, head of the N.Mindanao Evangelistic Institute in the Philippines. With our continued support to these fine individuals, Cutting Edge and you are helping to plant churches and spread the Gospel of Jesus Christ. This shirt will make people stop to read it! A bold statement on white, ash(light gray) or black tee. T-shirts are made from 6.1 oz. 100% pre-shrunk cotton Hanes Tagless Tee. Half of the purchase price of these shirts will go to support our 12 Spanish translators & Rev.Enrique Mejia, Church Planter in the Dominican Republic, our Portuguese translator in Brazil and Rev.Glen Namoc, head of the N.Mindanao Evangelistic Institute in the Philippines. With our continued support to these fine individuals,Cutting Edge & you are helping to plant churches and spread the Gospel of Jesus Christ. This sweet little girl with dark hair & eyes wears an enormous hat! She has her kitten with her in a white wicker chair. Available in white, this tee comes in Youth sizes and Adult sizes through Large. T-shirts are made from 6.1 oz. 100% pre- shrunk cotton Hanes Tagless Tee. Half of the purchase price of these shirts will go to support our 12 Spanish translators & Rev.Enrique Mejia, Church Planter in the Dominican Republic, our Portuguese translator Brazil & Rev.Glen Namoc, head of N.Mindanao Evangelistic Institute in the Philippines. With our continued support to these fine individuals, Cutting Edge and you are helping to plant churches and spread the Gospel of Jesus Christ. For the diva or for your best friend, this tee makes an interesting statement. Be ready for comments from strangers. Available in white, only. T-shirts are made from 6.1 oz. 100% pre-shrunk cotton Hanes Tagless Tee. Half of the purchase price of these shirts will go to support our 12 Spanish translators & Rev.Enrique Mejia, Church Planter in the Dominican Republic, our Portuguese translator in Brazil and Rev.Glen Namoc, head of the N.Mindanao Evangelistic Institute in the Philippines. With our continued support to these fine individuals,Cutting Edge & you are helping to plant churches and spread the Gospel of Jesus Christ. 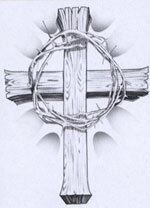 Powerful graphic of Jesus on the Cross shows His love for us. Available in White and Med-XL.Shirts are made from 6.1 oz. 100% pre-shrunk cotton Hanes Tagless Tee. Half of the purchase price of these shirts will go to support our 12 Spanish translators & Rev.Enrique Mejia, Church Planter in the Dominican Republic, our Portuguese translator in Brazil and Rev.Glen Namoc, head of the N.Mindanao Evangelistic Institute in the Philippines. With our continued support to these fine individuals,Cutting Edge & you are helping to plant churches and spread the Gospel of Jesus Christ. 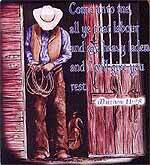 A rodeo bull rider shows his trust in God. 'Unto Thee, O Lord' Ps.25:1. Available in white, ask (light gray) or black. T-shirts are made from 6.1 oz. 100% pre-shrunk cotton Hanes Tagless Tee. Half of the purchase price of these shirts will go to support our 12 Spanish translators & Rev.Enrique Mejia, Church Planter in the Dominican Republic, our Portuguese translator in Brazil and Rev.Glen Namoc, head of the N.Mindanao Evangelistic Institute in the Philippines. With our continued support to these fine individuals, Cutting Edge and you are helping to plant churches and spread the Gospel of Jesus Christ. 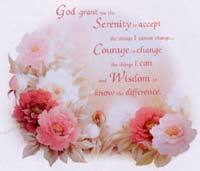 Beautiful old-fashioned roses frame the Serenity Prayer. Choice of white,ash (light gray) or natural tee.T-shirts are made from 6.1 oz. 100% pre-shrunk cotton Hanes Tagless Tee. Half of the purchase price of these shirts will go to support our 12 Spanish translators & Rev.Enrique Mejia, Church Planter in the Dominican Republic, our Portuguese translator in Brazil and Rev.Glen Namoc, head of the N.Mindanao Evangelistic Institute in the Philippines. With our continued support to these fine individuals,Cutting Edge & you are helping to plant churches and spread the Gospel of Jesus Christ. Sing Unto Him a New Song.Play Skillfully with a Loud Noise! Choice of white,ash (light gray) or black tee.T-shirts are made from 6.1 oz. 100% pre- shrunk cotton Hanes Tagless Tee. Half of the purchase price of these shirts will go to support our 12 Spanish translators & Rev.Enrique Mejia, Church Planter in the Dominican Republic, our Portuguese translator in Brazil and Rev.Glen Namoc, head of the N.Mindanao Evangelistic Institute in the Philippines. With our continued support to these fine individuals,Cutting Edge & you are helping to plant churches and spread the Gospel of Jesus Christ. For sisters, secret-sisters or sisters in Christ, this tee would be a great gift for a sister! Available in Youth sizes & Adult sizes Small & Medium, When I need a lift, GOD gives me a Push is available in white! T-shirts are made from 6.1 oz. 100% pre-shrunk cotton Hanes Tagless Tee. Half of the purchase price of these shirts will go to support our 12 Spanish translators & Rev.Enrique Mejia, Church Planter in the Dominican Republic, our Portuguese translator in Brazil and Rev.Glen Namoc, head of the N.Mindanao Evangelistic Institute in the Philippines. With our continued support to these fine individuals, Cutting Edge and you are helping to plant churches and spread the Gospel of Jesus Christ. This shocking graphic allows one to ponder their eternal state. Available on white,black or ash (light gray) tee.T-shirts made from 6.1 oz. 100% pre-shrunk cotton Hanes Tagless Tee. Half of the purchase price of these shirts will go to support our 12 Spanish translators & Rev.Enrique Mejia, Church Planter in the Dominican Republic, our Portuguese translator in Brazil and Rev.Glen Namoc, head of the N.Mindanao Evangelistic Institute in the Philippines. With our continued support to these fine individuals,Cutting Edge & you are helping to plant churches and spread the Gospel of Jesus Christ. Retro-look with flowers, any girl would love to have one of these. Available on white tee. T- shirts are made from 6.1 oz. 100% pre-shrunk cotton Hanes Tagless Tee. Half of the purchase price of these shirts will go to support our 12 Spanish translators & Rev.Enrique Mejia, Church Planter in the Dominican Republic, our Portuguese translator in Brazil and Rev.Glen Namoc, head of the N.Mindanao Evangelistic Institute in the Philippines. With our continued support to these fine individuals,Cutting Edge & you are helping to plant churches and spread the Gospel of Jesus Christ. Beautifully framed with pink,peach & yellow roses, this would make a great gift for any lady. Available in all adult sizes, you can have this in a white, ash (light gray) or natural tee. T-shirts are made from 6.1 oz. 100% pre-shrunk cotton Hanes Tagless Tee. Half of the purchase price of these shirts will go to support our 12 Spanish translators & Rev.Enrique Mejia, Church Planter in the Dominican Republic, our Portuguese translator in Brazil and Rev.Glen Namoc, head of the N.Mindanao Evangelistic Institute in the Philippines. With our continued support to these fine individuals, Cutting Edge and you are helping to plant churches and spread the Gospel of Jesus Christ. A good title for this graphic is 'Put Your hand in the of the One who stilled the waters'. Powerful truth for men or women to wear on a tee. Available in white, only. T-shirts are made from 6.1 oz. 100% pre-shrunk cotton Hanes Tagless Tee. Half of the purchase price of these shirts will go to support our 12 Spanish translators & Rev.Enrique Mejia, Church Planter in the Dominican Republic, our Portuguese translator in Brazil and Rev.Glen Namoc, head of the N.Mindanao Evangelistic Institute in the Philippines. With our continued support to these fine individuals,Cutting Edge & you are helping to plant churches and spread the Gospel of Jesus Christ. Wait upon the Lord and renew your strength, soar on wings like eagles. Isaiah 40:31. This beautiful eagle is caught up in the heavenlies. Available on white,ash or black tee. T-shirts are made from 6.1 oz. 100% pre-shrunk cotton Hanes Tagless Tee. Half of the purchase price of these shirts will go to support our 12 Spanish translators & Rev.Enrique Mejia, Church Planter in the Dominican Republic, our Portuguese translator in Brazil and Rev.Glen Namoc, head of the N.Mindanao Evangelistic Institute in the Philippines. With our continued support to these fine individuals,Cutting Edge & you are helping to plant churches and spread the Gospel of Jesus Christ. 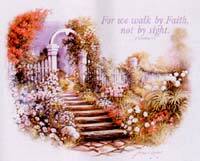 This Kincaid-type view of a garden in bloom makes a beautiful tee. Available on white,ash or natural. T-shirts are made from 6.1 oz. 100% pre- shrunk cotton Hanes Tagless Tee. Half of the purchase price of these shirts will go to support our 12 Spanish translators & Rev.Enrique Mejia, Church Planter in the Dominican Republic, our Portuguese translator in Brazil and Rev.Glen Namoc, head of the N.Mindanao Evangelistic Institute in the Philippines. With our continued support to these fine individuals,Cutting Edge & you are helping to plant churches and spread the Gospel of Jesus Christ. Wooden Cross and Crown of Thorns Sweat shirt. T-shirts are made from 6.1 oz. 100% pre-shrunk cotton Hanes Tagless Tee. Half of the purchase price of these shirts will go to support our 12 Spanish translators & Rev.Enrique Mejia, Church Planter in the Dominican Republic, our Portuguese translator in Brazil and Rev.Glen Namoc, head of the N.Mindanao Evangelistic Institute in the Philippines. With our continued support to these fine individuals,Cutting Edge & you are helping to plant churches and spread the Gospel of Jesus Christ. ws-5575-T-Shirt -Do Lord!-Do Remember Me! Do Lord! is an adorable Noah's Ark with talking animals. Available in white tee in Youth sizes. T-shirts are made from 6.1 oz. 100% pre-shrunk cotton Hanes Tagless Tee. Half of the purchase price of these shirts will go to support our 12 Spanish translators & Rev.Enrique Mejia, Church Planter in the Dominican Republic, our Portuguese translator in Brazil and Rev.Glen Namoc, head of the N.Mindanao Evangelistic Institute in the Philippines. With our continued support to these fine individuals, Cutting Edge and you are helping to plant churches and spread the Gospel of Jesus Christ. Expect a Miracle is a cross-stitch look Noah's ark, animals & rainbow. This is so sweet that we make it available for children & for adult sizes through XL & the nightshirt! Available in white, only. T-shirts are made from 6.1 oz. 100% pre-shrunk cotton Hanes Tagless Tee. Half of the purchase price of these shirts will go to support our 12 Spanish translators & Rev.Enrique Mejia, Church Planter in the Dominican Republic, our Portuguese translator in Brazil and Rev.Glen Namoc, head of the N.Mindanao Evangelistic Institute in the Philippines. With our continued support to these fine individuals,Cutting Edge & you are helping to plant churches and spread the Gospel of Jesus Christ.